We’d love your help. Let us know what’s wrong with this preview of Red Sonja #4 by Gail Simone. Red Sonja is just inches from death, when voices from the past call her away from digging her own grave, to fight possibly the last battle of her life, against the woman who taught her everything she knows about combat! With special variant cover by guest-star Ming Doyle! To ask other readers questions about Red Sonja #4, please sign up. Every now and then, its fun to get lost in a setting and a character to the degree that all that matters is the fun you have while reading (or watching, as may apply). This is one of the things that draws me to sword and sorcery stuff so much. There are some really fun tropes in the genre that otherwise would seem odd and out of place, but here, they are perfect. And nothing exemplifies sword and sorcery like Red Sonja and Conan do, characters who are the poster characters of the genre and have been around for decades. With her fourth issue, Gail Simone proves once again why she is such a good fit for this rebooted series. The new issue continues a tradition of action-packed stories with some really fantastic art. And the same goes for artist Walter Geovani. I’ve always loved his work, and he continues to impress. Red Sonja 04The last issue marked a really low emotional point for Sonja. We saw her at a really low point in her life but we also got to see some amazing characterisation brought to visual life with Walter’s artwork. He made each panel, each page stand out. I’ve been a fan of the series from the first issue and four issues on, I’m still in love, something that I don’t see going the other way any time soon. In this issue, we continue to see how Dark Annisia is treating the people of Patra. She has quarantined the city and prevents anyone from entering or leaving, enforced with a very strict and uncompromising policy that ends in nothing but death. Right from the start, we get a hint that is going to a really bloody and really violent issue, in a way that it seems neither gratuitous, nor an afterthought, or just because. The violence is not a throwaway tool relied on as a crutch, it is used build character and show off their natures. And the way that Gail ends Annisia’s subplot in this issue, essentially rechristening her and giving her a new identity that reflects Annisia’s relationship with Sonja, it hints at a really explosive showdown. Not that we see that showdown here, since this issue is all about the build-up, something that Gail pulls off really well while still moving the plot forward. What Gail does with Annisia, she does with Sonja as well. Near-death but at the gates of deliverance nonetheless, the second half of the issue deals with how Sonja essentially gets back on her feet, how she rediscovers the core of her being. Even with all the action that is packed into this issue, we have time for character development and for back-story as well, the latter being when Annisia and Sonja were friends and fellow gladiators. We’ve seen similar flashbacks before in the previous three issues and this time, we see just how both Annisia and Sonja made their names as accomplished duelists. And framing all of that is, like I said, how Sonja fights back to rediscover her fighting spirit, how she becomes the vengeful (and even altruistic) Sonja that we know. We saw brief glimpses of it in the very first issue, and we see that again here too. Gail hasn’t led us astray yet and she continues to build on all her good work from the previous issues. One great issue follows another and I got my fingers crossed that this goes on for another 10-15 issues at the least. Story-wise, the absolute best part of the issue is when Sonja, in her delirium, is singing a bawdy song, enjoying a skin of wine in the process. The song’s lyrics are quite apt, describing Sonja herself, and they also do much to relieve the tension of the story. This is one of Gail’s trademark “light-hearted” moments, and I wish there was more. The art team of Walter, colourist Adriano Lucas and letterer Simon Bowland once again deliver a really wonderful issue. At this point, there isn’t any further praise that I can give to them. They are doing a great job issue-to-issue. We see a lot more of Annisia’s mutant hordes this time, which we last saw in the second issue. This time, given that the panels with them are not so… cluttered, the villains stand out. And there is a lot of diversity to how they are drawn and coloured, which is always nice to see. There’s no reliance on reusing the same models over and over again, which is important. And all the action scenes, whether with Annisia or Sonja herself, are packed with energy. There is a slight lack of full-on unrestrained action, but not too much. There’s enough here to impress. The main cover by Jenny Frison and the variant by Ming Doyle are both rocking covers as well. The first one feels a little off, but mostly because I’ve seen the full artwork without the design, but the variant is definitely superb. Gail’s idea of getting female artists to do the covers for the series is an initiative that has really paid off, I have to say. Each and every cover so far has been impressive and these two are no exceptions. 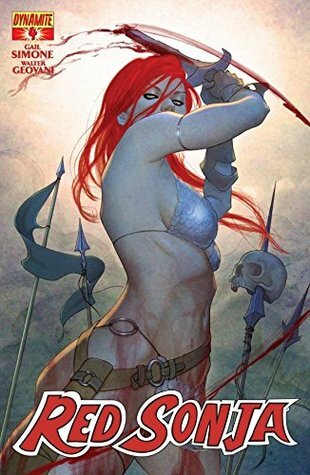 I’m sure that once the series is in its third arc or something, we will see a Gail Simone Red Sonja artbook that collects all these covers and some of Walter Geovani’s pages too. That’d be fantastic. With #5 next month, we should definitely get to see another big confrontation between Annisia and Sonja. We’ve seen it once before, and we’ve seen that Sonja came off really bad there. Now its time for payback, for vengeance. This one is obviously a lull before the storm, building up to the final confrontation between Sonja and Annisia. Sonja gets in a little bit of roistering, and generally the characterisation across the board really lends a lot of richness to the story. Inking feels kinda off. Hurried? Gail Simone is a comic book writer well-known for her work on Birds of Prey (DC), Wonder Woman (DC), and Deadpool (Marvel), among others, and has also written humorous and critical commentary on comics and the comics industry such as the original "Women in Refrigerators" website and a regular column called "You'll All Be Sorry".